This is rudimentary ball mill as used in Uganda and Tanzania and some surrounding countries. 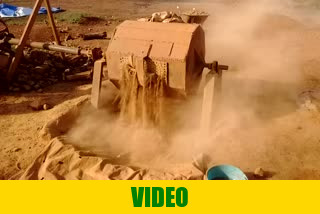 It is locally welded and in Swahili also known as "calasher", in English "crusher". It is batch ball mill. It discharges after 45 minutes. The opening have to be replaced with the screen as you can see on this video for material to come out. In our program Start Your Own Gold Mine we are not using this type of ball mills.